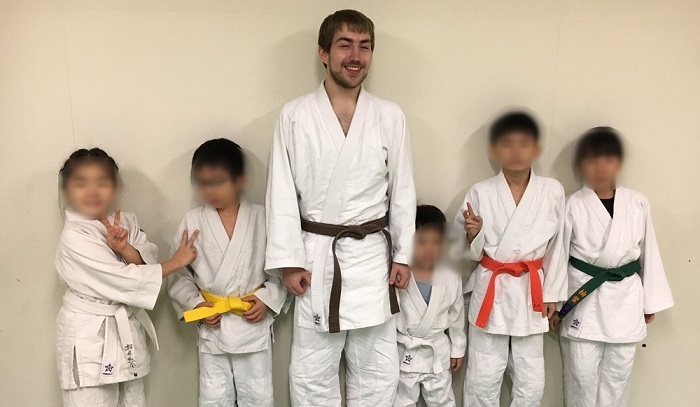 Alexander S. (19) from Germany tells us about his Working Holiday experience in a dojo in Tokyo. 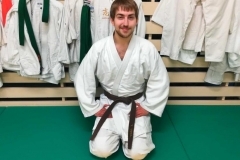 He has already a lot of experience as a judoka and has been working as a judo instructor in Germany. 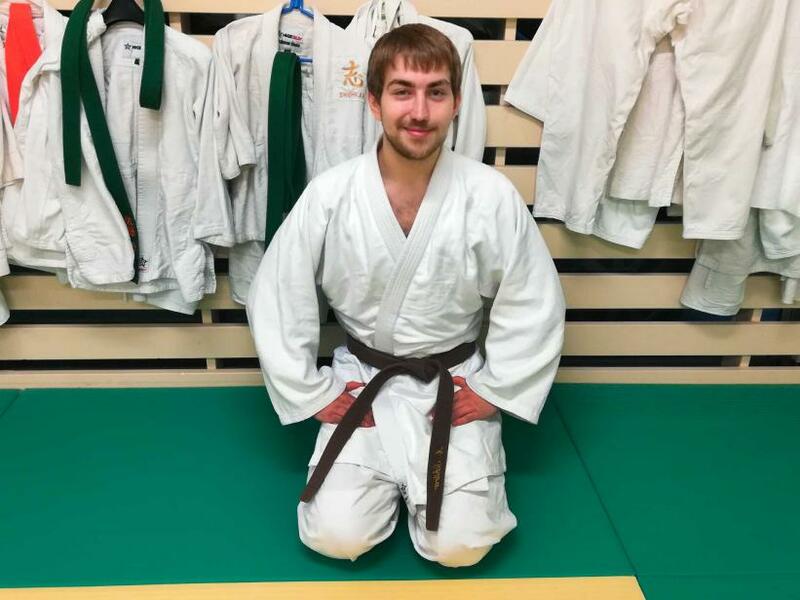 Now he got the terrific chance to work in the country where judo originated and learn the trade from actual Japanese instructors. He now works as one of the trainers of a kids’ class. Alexander, how did you find this job? It’s an interesting story. I was actually interviewing for a restaurant job, and it so happened that a few sport companies were also having a meeting in the restaurant at the same time. 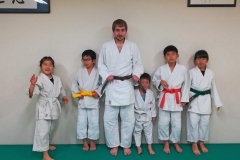 Since I wrote on my CV that I have practiced judo for many years, I was invited by one of the organizers to join the meeting and I got offered this job afterwards. I was indeed very lucky. I work at the dojo twice a week, usually Wednesdays and Fridays. 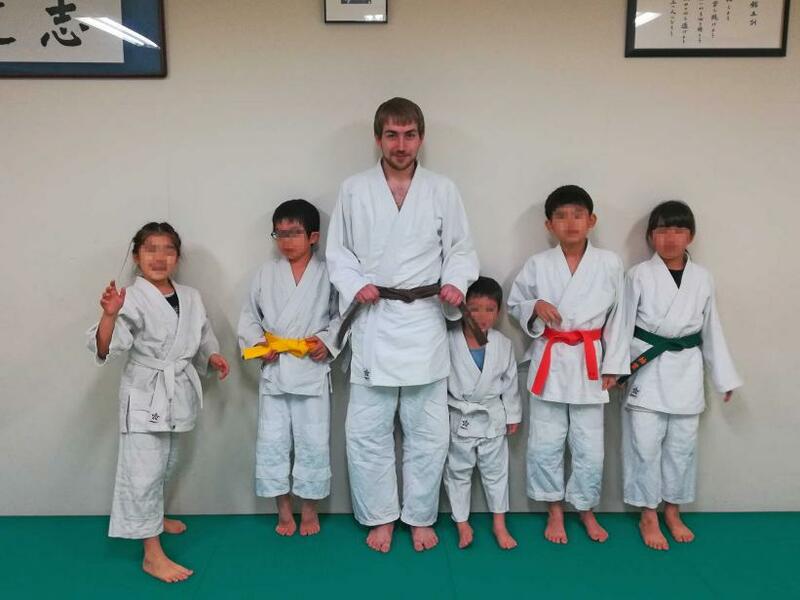 The kids’ training program is from 4.30pm to 6pm, and then I join the adult training hours. Sometimes one of the children receives a private training, during which I assist as a second trainer. What do you find challenging about this job? My Japanese level is very low. All my knowledge comes from a 2-week crash course I took in Germany. I am lucky that the other trainers speak a bit of English, and I even teach in English on Fridays. 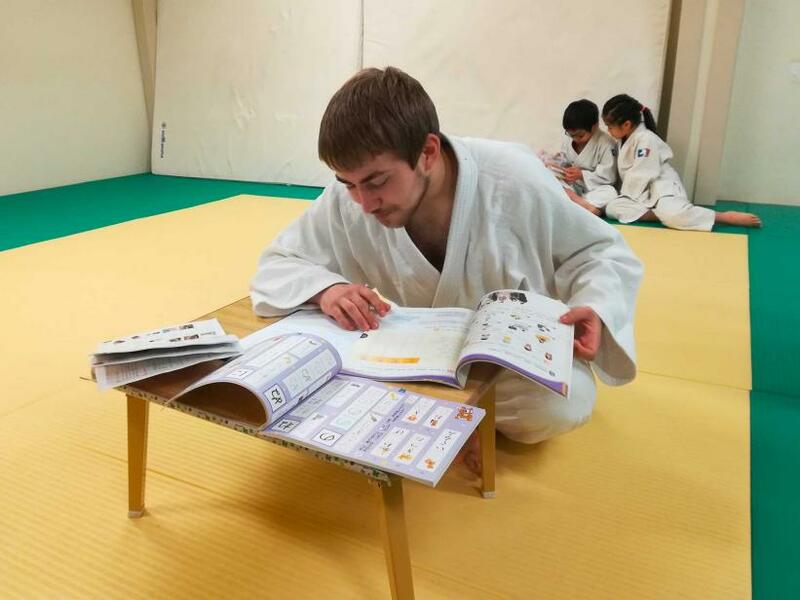 The school offers this special program where we try to teach the children some English while they train, so they gain more than just the physical abilities. 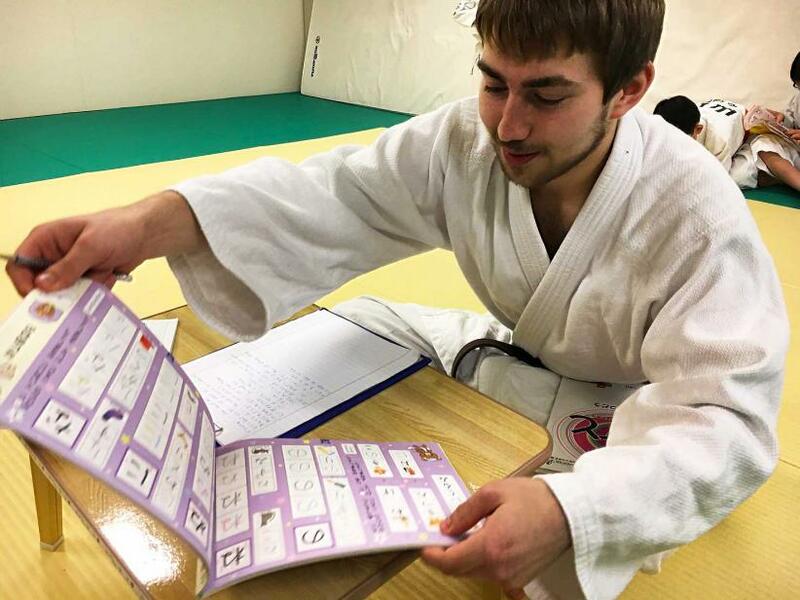 I actually already knew quite a few judo terms in Japanese as I learned them while I was training in Germany. If there is something I can’t explain using language, I just show them what I mean. So it turns out the skill that is actually most important for this job is my judo ability, and not my (Japanese) language ability. 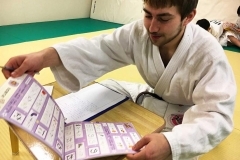 Does this job help you improve your Japanese? Yes, absolutely. I even come a little early to talk to the children sometimes. Sometimes I also study Japanese between trainings. I just bring my study books to the dojo and if I have questions there is always someone to help and advice me. What did you learn doing this job? Besides my Japanese, my English has improved as well. I have to communicate a lot in both languages so I slowly get better. Other than this I learned a lot in the adults training and improved my judo skills. This will be very useful for when I go back to work as a judo instructor in Germany again. Do you enjoy the job and are there things you don’t like? To be honest, there is nothing I don’t like about this job. I like every aspect about it. It combines well with my other job at the former mentioned restaurant. It helps me balancing my weekly schedule and I stay physically fit. We have a lot of fun during the training and I gain experience. It’s just the perfect combination of jobs. I earn 1000 yen per hour and work only 2 days a week. This is fine, but of course not enough to cover my expenses. I really need the other job in the restaurant where I work 8 hours a day, 3 days a week. With these 2 jobs together I make enough to live in Tokyo and I still have enough time for private activities and trips. I’m sure my answer will not be a surprise to many, but I have to admit it has to do with anime. Watching anime and reading manga made me curious about Japan and now I can experience the culture first hand. Would you recommend Japan for a Working Holiday? Yes, I would recommend it. Most people choose Australia and New Zealand for a Working Holiday, but I think Japan is still special and relatively unknown. There’s a whole new culture to explore and I have learned so many interesting things already. It’s absolutely great to spend some time in Japan in this way, working here gives me a new perspective. The language barrier might be higher than in other countries, but it wasn’t as hard as I first expected. A lot of people in Tokyo can actually speak some English, and even if they don’t, many people try hard to help you using just gestures and the few English words they know.